Fun and games for young and old, our archery parties can be tailored to suit your needs and are bespoke. Along with the help from our friends at Greenland’s Farm Village, we can offer you a fully inclusive day out. Archery and Food for your party. Be it young or old, archery birthday parties are good fun!!! We can offer onsite custom-built ranges for you to shoot on, or we come to your home or a venue of your choice, Venues will need to be inspected for safety reasons prior to the party. For the young ones we can offer archery in your own back garden with the Archery GB arrows equipment 6-8 years. Low power bows with safe sucker arrows. Traditional archery, Clout archery and different archery games. For the older kids, we can offer traditional target archery or field archery. Quick archery lesson coming up, traditional archery is done in a field but field archery is done in a woods!!! Traditional target archery party; generally, is a 1 hour session, comprising of an introduction into archery and safety, learning how to shoot, then its games time!!! balloons novelty targets depends on the group. Costs £12.00 per head max group size of 12. 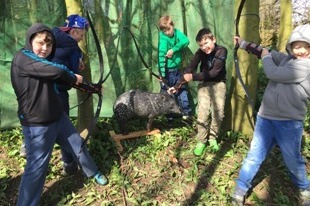 Field archery party; generally, is a 1.5 hour session, comprising of an introduction into archery and safety, learning how to shoot, introduction to 3D targets and to do an actual field course. Cost £15.00 per head max group size of 12.